Myanmar’s biggest city and former capital, Yangon is a city of stunning temples and religious sites, beautiful parks, historical colonial architecture and a quiet pace of life. 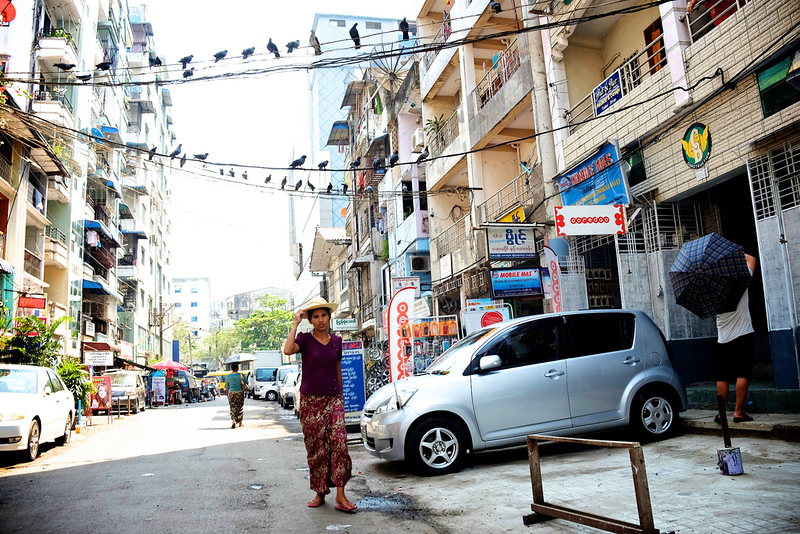 Myanmar’s hub city, Yangon is a great base for exploring the country. Formerly Rangoon, Yangon was Myanmar’s political and economic hub during its period as a British colony. Although it’s no longer the country’s capital (in 2005, the government moved all political offices to Naypyidaw), it remains Myanmar’s economic centre. Yangon’s combination of religious and historical sites, such as the Shwedagon Pagoda, slow pace of life, decaying colonial architecture and relaxing parks and lakes give it a unique and appealing character that can’t be found elsewhere in Southeast Asia. Yangon’s commercial centre, Downtown Yangon, is geographically the southern section of the city. Built around the Sule Pagoda and the Yangon River, Downtown Yangon is home to some of the city’s most impressive colonial buildings and historical sites. Major attractions in Downtown Yangon include the Sule Pagoda, Bogyoke Aung San Market, Maha Bandula Park and the Myanmar Independence Monument. The Strand Hotel, Yangon’s most historically significant hotel, is located on Strand Road in Downtown Yangon. Many of Yangon’s most popular tourist attractions, parks and historical sites are located in the area immediately north of Downtown. Northern Yangon is where you’ll find the world famous Shwedagon Pagoda, Kandawgyi Lake and other attractions. Further north is Inya Lake, Yangon’s largest lake and an exclusive neighbourhood home to the city’s elite. The largest lake in Yangon, Inya Lake is located in the north of the city. 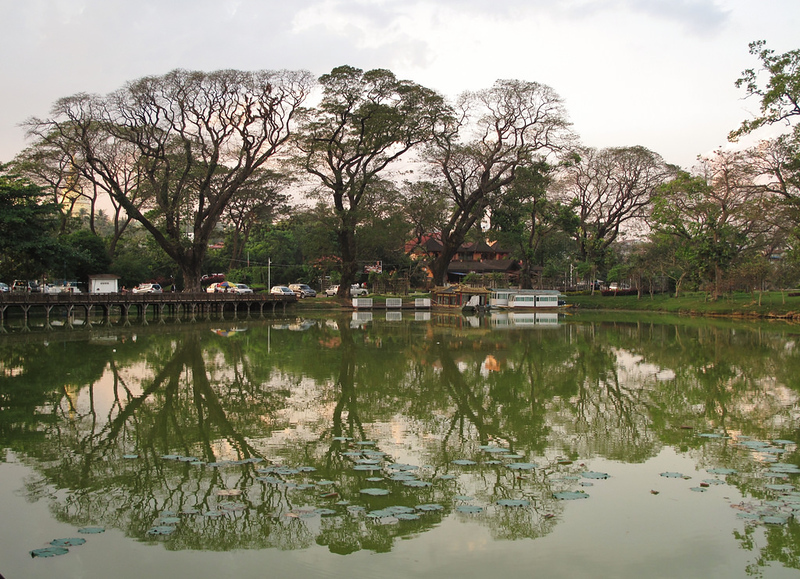 Created as Yangon’s water reservoir during the country’s period as a British colony, Inya Lake is today one of the city’s most exclusive neighbourhoods and a popular recreation spot for locals. 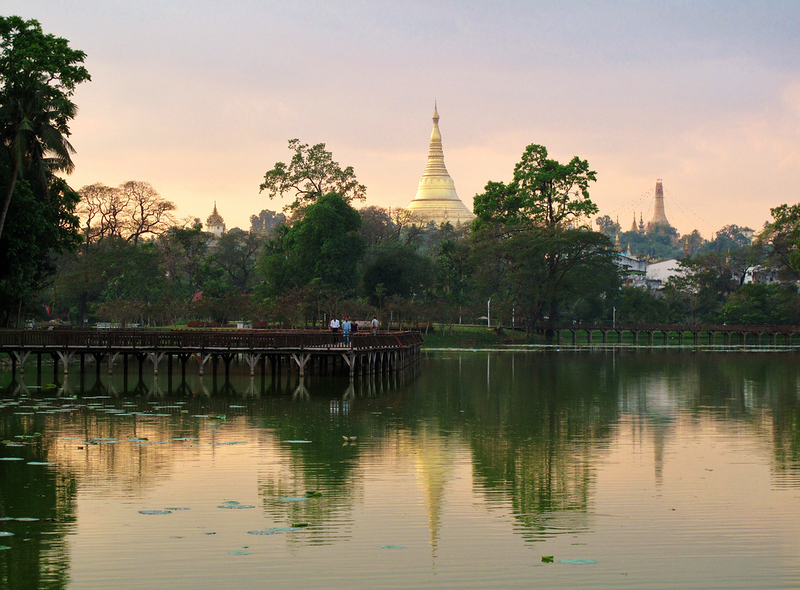 Located in northern Yangon, Kandawgyi Lake is a major landmark and a popular recreation area for city residents. Like Inya Lake, Kandawgyi Lake is an artificial lake created during the country’s period as part of the British Empire as a source of fresh water. Karaweik, a 1970s reconstruction of an ancient Burmese royal barge, is built on the eastern shore of the lake. Destroyed during World War II and later rebuilt in a traditional Burmese style, Yangon Central Railway Station is a major landmark in Downtown Yangon. The station serves as the hub of Myanmar’s extensive but rather slow railway system. Yangon’s most well known landmark, the Shwedagon Pagoda is a 99 metre historical stupa in Northern Yangon. As the country’s most important Buddhist site, the pagoda attracts locals in addition to a large number of tourists eager to see one of Buddhism’s most sacred stupas. Open from 6:30 am until 10:00 pm, entrance to the Shwedagon Pagoda is $8 USD or 8,000 kyat. Footwear is prohibited inside the grounds — most visitors leave their shoes close to the entrance while they view the pagoda. Conveniently located about one kilometre from the Shwedagon Pagoda in Northern Yangon, the Belmond Governor’s Residence is a luxurious hotel located inside a historical teak home surrounded by lotus gardens. Open since 1901, The Strand is one of Southeast Asia’s most historically significant luxury hotels. Past guests at this luxurious five-star hotel include Lord Mountbatten, Mick Jagger, David Rockefeller and Edward VIII. Located a short walk from the Sule Pagoda, the Sule Shangri-La Hotel is a modern five-star hotel in Downtown Yangon. A selection of spacious rooms and suites along with excellent facilities make this a great choice for a luxurious, comfortable stay in Yangon. Located close to the Yangon River on Strand Road in Northern Yangon, the Great Treasure Hotel is a modern three-star hotel. Clean and comfortable rooms along with a great location make this a convenient place to stay. Hotel Bahosi offers simple and minimalistic rooms in Downtown Yangon. Although the hotel’s rooms and facilities are basic, the convenient location and helpful staff make it a great base for exploring Yangon. With just 23 rooms, MK Hotel is a compact and cosy boutique hotel located close to St Mary’s Cathedral in Downtown Yangon. A good selection of clean and comfortable double and twin rooms are available for guests. Located in the centre of Downtown Yangon, Lotus Bed And Breakfast is a short walk from the Sule Pagoda and other landmarks. Rooms are simple and clean, with a convenient restaurant on site and a local fairly close to most of Downtown Yangon’s attractions. Conveniently located close to St Mary’s Cathedral, Shannkalay Hostel is an affordable hostel in Downtown Yangon. With private rooms and dorm beds, Shannkalay Hostel offers a great choice of budget accommodation for travellers exploring Yangon on a shoestring. Spotless and modern, Pickled Tea Hostel offers a selection of clean and comfortable rooms and dormitories. Located close to the Shwedagon Pagoda in Northern Yangon, Pickled Tea offers a convenient location and clean rooms with affordable pricing. Excellent food, beautiful surroundings and fantastic service, albeit at prices that aren’t cheap even by Western standards, make The Strand Grill a good upmarket dining option in Yangon. L’Opera Italian Restaurant serves high quality Italian cuisine beside Inya Lake. The outdoor dining area is a great place to enjoy Yangon’s warm and sunny weather. Located inside The Governor’s Residence, Mandalay serves tasty Southeast Asian food in a beautiful setting. A great choice for romantic dinners. L’Alchimiste serves excellent French food inside, and outside, a stunning colonial house on the banks of Inya Lake. Popular with Japanese expats in Yangon, Anaimo serves high quality Japanese food made using fresh ingredients. Taing Yin Thar serves excellent Burmese regional specialties cooked to a high standard in a rustic, relaxing environment. Located close to the Shwedagon Pagoda and opposite the Yangon Zoological Gardens, Mai Thai serves a selection of well known Thai dishes. One of several great cafés and bakeries in Yangon, Yangon Bakehouse offers tasty baked goods, healthy salads and fresh coffee. 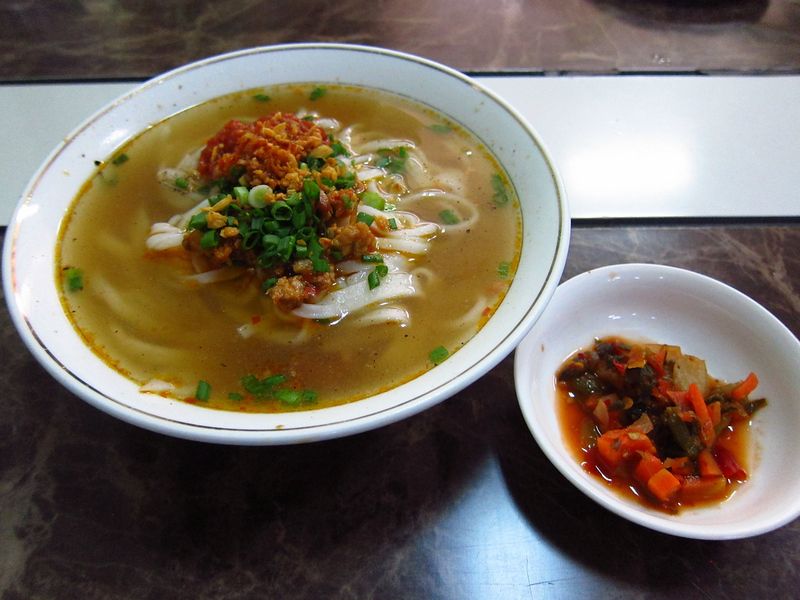 Located right in the centre of Downtown Yangon, 999 Shan Noodle House serves cheap and tasty noodles just a couple of minutes from the Sule Pagoda. Conveniently located close to People’s Park and the Shwedagon Pagoda, Feel Myanmar Food serves a selection of traditional Burmese dishes. Yangon International Airport is one of three international airports in Myanmar. Yangon Airport handles flights from Southeast Asian regional centres such as Bangkok, Singapore, Saigon, Hanoi and Kuala Lumpur. Flights to Yangon are also available from smaller Southeast Asian cities such as Chiang Mai and several major cities in India. Longer distance flights also depart from major East Asian cities such as Seoul and Tokyo. Yangon International Airport also handles domestic flights to and from most destinations in Myanmar, such as Mandalay, Bagan, Pathein and Thandwe. Check Skyscanner to compare airlines for the best prices and flight times to Yangon. Yangon is the hub of Myanmar’s extensive but slow railway system. 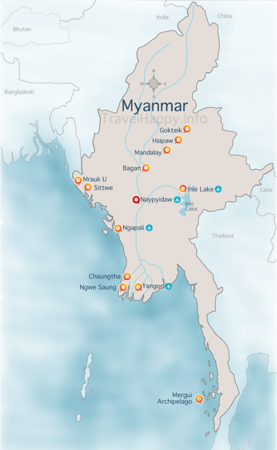 Trains connect Yangon with other cities and destinations such as Mandalay and Bagan. Although it’s possible to get around Myanmar by train, travel times are very slow and rides can be extremely bumpy. Yangon is connected with most other destinations in Myanmar by bus. Due to the country’s partially completed new highway network, journeys can range from fast and relatively easy to slow and uncomfortable. Destinations such as Mandalay, Bagan and the Ayeyarwady Region can be reached within six to ten hours from Yangon. The majority of buses to and from Yangon use the Aung Mingalar Bus Station, which is located close to Yangon International Airport.